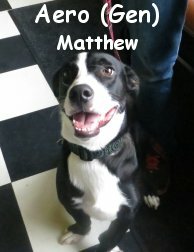 With all of this bad weather we've been having lately I though it would be appropriate to post a link on helping a dog with its fear of thunder and lightning. I searched thru a few different articles and this one from the Humane Society is the best one I've been able to find. On another note here is a crazy video from November of last year. After heavy rain fall flooded some of the rivers over in Mason County the salmon were so confused that they started swimming across the roads! Check out the video to see what one lucky dog scored from all the confusion. Well folks, we made it through another work week. 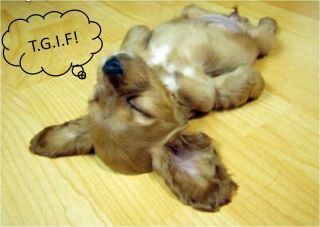 That's right, its Friday. To celebrate I found hilarious clips from all over the net to share with you guys, hoping to inspire some smiles on this dreary start to our weekend. Ever wonder what your pets do while you aren't at home with them? Thanks for checking in! 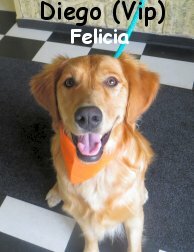 Be sure to visit on Monday to keep up on the happenings here at Fort Fido. I wrangled y'all up some dog jokes today... Hopefully someone out there will give me a "sympathy chuckle" at the very least. Haha, enjoy! A blind man walks in to a department store with his seeing eye dog on a leash. The store manager behind the customer service counter looks up, notices the customer is blind, and quickly looks away again. Out of the corner of his eye he sees the blind man start swinging the dog over his head with its leash. Shocked, the manager runs over and says, "Mister, is there a problem – is there something I can help you with?" The blind man calmly replies, "No thanks – I’m just looking around." A burglar is stalking stealthily around the living room of the house he's just broken into. He jumps with fright when he suddenly hears a voice behind him saying "Croaoak, beware, Jesus watches you" He turns around, swings the beam of his flashlight in to direction the voice comes from and sees what indeed the voice had made him think once he was over his first fright: a parrot. The bird repeats "Croaoak, beware, Jesus watches you" The burglar walks up to the cage and asks "And what may your name be? The parrot answers "Coco." The burglar snickers and says "That's a very stupid name for a parrot." The parrot answers "Maybe, but not half as silly as Jesus for a Pitbull Terrier"
As before, the dog tosses a mouthful of chips onto the table for betting, and once again the couple walk away winners. Not to waiver from the drill, the dog jumps up on the table, scoops up their winnings and jumps off the table. To yet another table they head. This time the man's dog dumps all of their winnings on one hand of Blackjack. Remarkably, the dealer presents an ace and king to the man. A bit shocked, the dealer presents the man with his winnings. Not missing a beat, the dog hurls its massive body onto the game table, grabs all of their chips in its mouth and jumps back down to the man's side. Tired from all of the gambling, they find a bar to sit down at. The man asks for a pint of ale for his dog and just a club soda for himself. Puzzled by the man's request, and the large pile of chips at the dog's side, the bartender asks what type of dog does this very wealthy man have? Patting his canine companion on the head, he smiles and says, "An Irish Better... What else?" P.S. O, I can't resist one more of these gems... How do you stop your dog from barking in your front yard? Put it in your back yard. Every once in awhile at Fort Fido, we get some absolutely identical looking canine guests. Believe it or not, at times it can be very difficult to tell two dogs apart. One must really study the individual dogs, to find identifying attributes, then share their findings with the rest of the staff (on our communication boards). Most importantly, when the owners arrive, we must know without a shadow of a doubt, who's who! It can be surprisingly tricky, for instance, on a "Chocolate Lab Day", when there are seven of the same breed in one play-area, to figure out exactly who "Coco" is, amongst a sea of super-similar chocolates lol... They have a tendency to melt together, especially when five+ customers arrive at once for pick-up, and you are on the fly. Luckily, we've developed some tricks, in order to make certain we know which dog is which at all times. Currently, other than a handful of Labrador Retrievers, and a couple of English Springer Spaniels, the most perplexing twin duo has to be Yuki and Sam. Both high-energy Shibu Inus, Yuki & Sam poses matching physical features, as well as matching personalities and play-styles! They are also about the same age. Don't believe me? Checkout these photos we took of the "Terrible Twosome" (only kidding of course) yesterday. They are the definition of "Bash Brothers", they love to play together, hard, fast, and furiously. Click on the individual photos to enlarge them. Hahaha, I know right? Almost indistinguishable! This first one has been on YouTube's "Most Viewed" for quite some time now. It's all about GSDs, and what they can do. Good golly! Needless to say, no one is gonna be messing with that Junior Handler. Way to go girl! This second clip, compliments of Juno's Dad (Thanks John! ), is just plain awesome... A husky having a blast in a huge Autumn leaf pile. Too fun! It doesn't get much cuter than that folks. This is Eebee, she is a 1 year old, black and white, Lhasa Apso/Cocker spaniel. Eebee had her assessment this past Saturday and although she was a bit timid at first she quickly warmed up and started playing, she especially enjoyed playing with Blue (Old English Bulldog) And Sammy (Puggle). Eebee definitely passed her assessment and is welcome back anytime. Milly, a Puerto Rican Chihuahua has been announced by Guinness World Records﻿ as the Worlds smallest dog. When measured by height Milly stands a mere 3.8 inches tall and weighs in just under a pound! That's shorter than a soup can and lighter than one of your shoes! While researching this article, I found some other hilarious record holding pups! This is Puggy. He's a Pekingese with a 4.5 inch long tongue! It's so long in fact that his mom, Becky has to cut his food into small pieces so he can actually eat it. ﻿This pup's claim to fame is for being able to hold not just one or two, but FIVE tennis balls in her mouth at once. Augie, an 8-year-old golden retriever is suited perfectly for this record. Another catch and hold record, but this time Frisbees! Rose, a 6-year-old Labrador retriever/border collie mix, can catch and hold up to seven Frisbees (thrown separately) in his mouth at one time. what an amazing talent! "Tillman, an English bulldog, traveled a 100-meter stretch of parking lot in just 19.68 seconds during the 2009 X Games in Los Angeles, winning him a world record and making him the Tony Hawk of the canine world." How radical is that?? Tillman can skate better than me!! All of these and many more can be found on This page, and includes dogs and cats with unique talents, and World Records set with those talents. Fort Fido employee, Danielle, sent me this fun photo she took near Steilacoom. It's of this gentleman, who looks to have made, a special dog-haulin trailer for his motorcycle. Too cool lol! That pooch, which looks to be a Golden Retriever, sure is riding in style. Thanks for the pic Danielle! Over this last weekend, I came across two hilarious canine video clips from YouTube. Up first, is one that reached the number one spot of YouTube's "Most Viewed" for awhile. I suppose that it's really not that "Hilarious" but it is certainly remarkable none the less. Whoa! I don't know that I would want that pup in The Fort, what an escape artist! Our main Catahoula Leopard Dog-Man, Rainier, just took a visit to Ewe-topia! Awhile back, I wrote about Gibson and I's adventure there... The place is awesome, and I highly recommend taking your dog there for some "Farm Fun", no matter what size or breed they are. Your dog can herd sheep, and or ducks, with no experience necessary. It's a blast! The folks that run the place are very kind and knowledgeable. There is even an off leash dog park area with some agility obstacles. Rainier did extremely well during his visit, I was quite impressed... My "Herding Dog" Gibson, didn't get nearly as involved as Rainier did lol. First rate job boy! It looks like you'll have a career in Sheep Herding in no time... That is of course, as soon as your pops ponies up and gets you a flock. Hahaha! Enjoy this clip, sent to me from Rainier's owners, of him, busting out his herding skills on those wild and wooly sheep! Thanks for telling us about your stay there guys, and, thank you very much for the video. Here is a nice shot of Edison having a blast with The Fort Friend, Rusty. P.S. 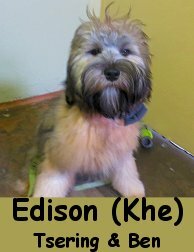 Dogs 101 snippet on the Lhasa Apso. HERE. Here are 2 new members of the Fort Fido pack for you to meet. First up is this 9 Year old black and white Papillon named Kirby. He showed up bright and early this morning for his assessment and did a great job! Despite his age Kirby is still quite an energetic dog and quickly started exploring his new environment. Although he didn't play much he seemed to enjoy watching some of the younger pups play and I'm sure after a few more visits he'll join in on the fun. 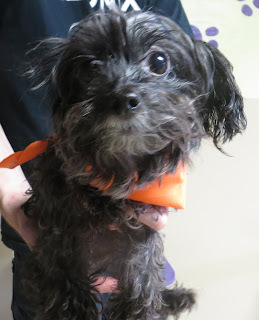 This is Tama, she is an eight year old Yorkipoo who assessed with us on Saturday. Tama also did great on her assessment and will be boarding with us soon. Shepherd Time! Featuring Bess and Kingsley. Pancake gets down with them too! Also, we had a whole lot of long-time pals, Lucy & Gracie, ripping it up today. We had some "Golden Boys", Finn & Jack, becoming the best of friends. There was a wee bit of "Dane Love" happening as well... You know, the love affair that is, Athena & Theodore. Upstairs in the Little Roll, they were not to be outdone! This clip features a small cross section of today's fun-filled events. NY Times My Story "Bad Dog"
Ooo! Sign me up for an order of a few of these bad boys! I am certain I could find a use for them here at The Fort lol... O OK, you're right, I wouldn't use them here. They'd sure be useful for Military and Search & Rescue dogs out on missions though. Haha! That was a cute one, even though around here, we are suckers for anything that has to do with American Eskimos. I always love these types of stories. There are certainly some great programs out there. Animals truly can, and do, help in healing people. I thought cats were the only ones who commandeered these things, hilarious! I'm gonna go ahead and totally, 100%, agree with this lol. Those are definitely some things better off unsaid. Lucky came in for an assessment over the weekend and did a great job! Lucky is a friendly, 7 month old Poodle/Retriever mix. Lucky chose to take it slow on his first day and didn't play a whole lot but did enjoy meeting all the other pack members and exploring his new surroundings. I'm sure after he's a bit more comfortable here he'll be playing hard with all his new friends. Our friend Riley just got a sidekick!! this is Piper, the tri-color Papillon also known as "the butterfly dog" or "Continental Toy Spaniel" and the breed hails from France. According to legend, Marie Antoinette carried a Papillon with her to the guillotine, the dog was spared and lived out the rest of it's life at a building in Paris that is still called Papillon House to this day. Great dogs, with great history! Piper is getting all of her stuff ready to come join us at The Fort and we couldn't be more excited to have her. We have also received the newest issue of The Pet Connection's bi-monthly newsletter featuring yet another awesome article from our good friend that I'm sure some of you remember Garrett Stevens of Alpha and Omega Dog Training. So next time you're at The Fort, be sure to grab a copy of it on your way through the lobby! Thanks for reading and have a fantastic weekend! Be sure to tune in Monday to check out this weekend's assessment. We just had the wonderful opportunity of assessing Diego. He is a one year old, sixty pound, reddish colored, Golden Retriever. Diego stayed with us in The Fort's Big Roll. He bounded in with joy, eager to make friends and have a nice time. Although a bit on the small side for his breed, Diego's large personality makes for a remarkable addition to the pack. Diego may hangout with us here at Fort Fido anytime, and we hope that he will, lickety split. This morning we assessed Bounce! 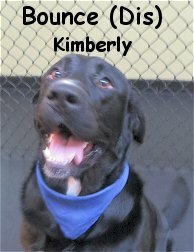 He is a lovely, one year old, 125 pound, Bernese Mountain Dog & Black Labrador Retriever Mix. Bounce is a well mannered and handsome fellow who took to the place quickly. He really did a swell job inside of The Fort's Big Roll, meeting, greeting, and having a good time with all. This benevolent canine was right at home here with the pack. We plan on seeing him again very soon for some Overnight Boarding... We have a feeling that Bounce will think of his stay as a real treat. Way to go pal, see ya soon! Aero is a fun-loving, one year old, 37 pound, Border Collie & Corgi Mix. Aero's sis, Angel, is a gorgeous, one year old, 40 pound, Australian Cattle Dog Mix. Both Aero and Angel had their assessments this morning in the Medium Roll. Like we anticipated, Aero, went head first into the action. He wasted no time getting to know the other pack members, playing with several of them whole-heartedly. 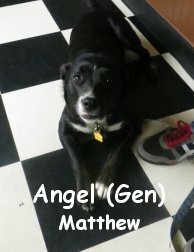 Angel on the other hand, spoke great "Dog" like her bro, but took her time getting to know the others. She has a very sweet demeanor, and acts quite "lady-like"... Leaving the rough housing play to brother Aero. These two canines were a pleasure to have at Fort Fido today, and they are welcome back anytime. Well done you two! Here's to seeing you again soon! Happy Labor Day! I hope you all had a great time this weekend and are enjoying these last few days of summer. 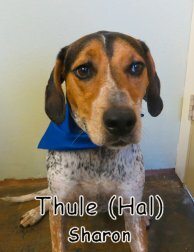 Last Friday we had the pleasure of meeting Thule, she is a very social, 2 year old Catahoula Leopard Dog. She had a great first day and played well with the other dogs in the big roll. We look forward to seeing her again soon.